The Water Cooler Company was established in 2005 and in the same year our directors started London’s first Man and Van removals company. Man and Vans was established to bring a professional approach to an industry that had previously been dominated by one-band bands and cowboys. 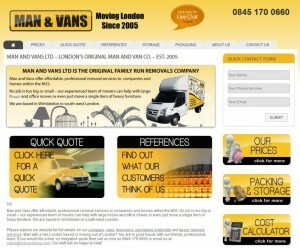 We were the second company in the Man and Van business to be formed as a limited company – across the whole of the UK! And have since moved on to become a market leader within the M25 for light removals and a certain amount of larger house removals. The owners remain in daily guidance of the team – which has been with us for many years now. We take pride in offering our customers a friendly and reliable service. Our fully-trained staff are professional and experienced and come to all jobs with all the equipment and quality controls to tackle any job, no matter how big or small. We have the capabilities to move customers from a bedsit, a 7 bedroom house or an office and we can even take care of all your packing and storage requirements. We are a UK registered limited company and our service is fully insured so you can be sure that your goods are safe and handled with care. You can be assured that you are dealing with a company which prides itself on its reputation. If you have any questions or issues with our service please email them directly using contact@manandvans.com or go to www.manandvans.com.